Here’s your opportunity to experience Africa, Maroons, and a famous Muslim comic from the U.S. Do you know what Maroons are? 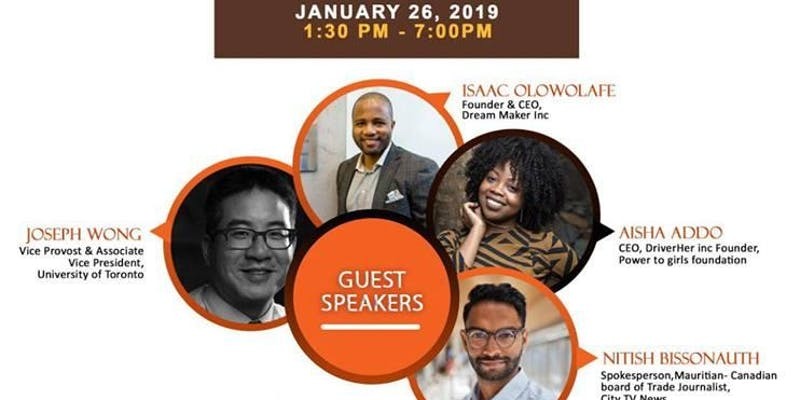 With Black History Month a few days away, you might be interested in some upcoming events or meeting the author of a children’s book on the subject. 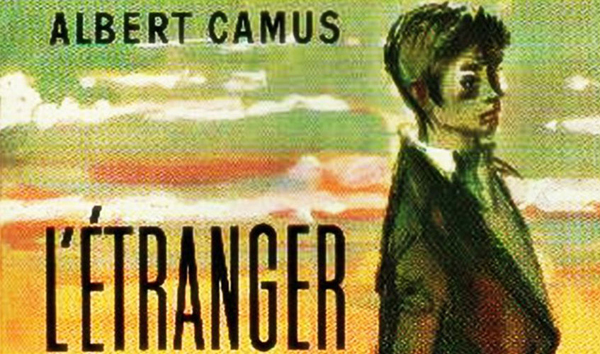 How about learning about French author Albert Camus in Algeria? Or start now to celebrate Chinese New Year’s with a group of Chinese-Canadian seniors. 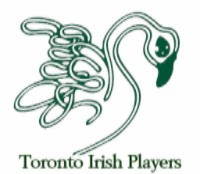 The Irish Players are looking for volunteers and some Italians are exhibiting modern designs. From our Jewish community, we have Sephardic songs and storytelling, and a Yiddish dance party. A Jewish author talks about the global resurgence of antisemitism. 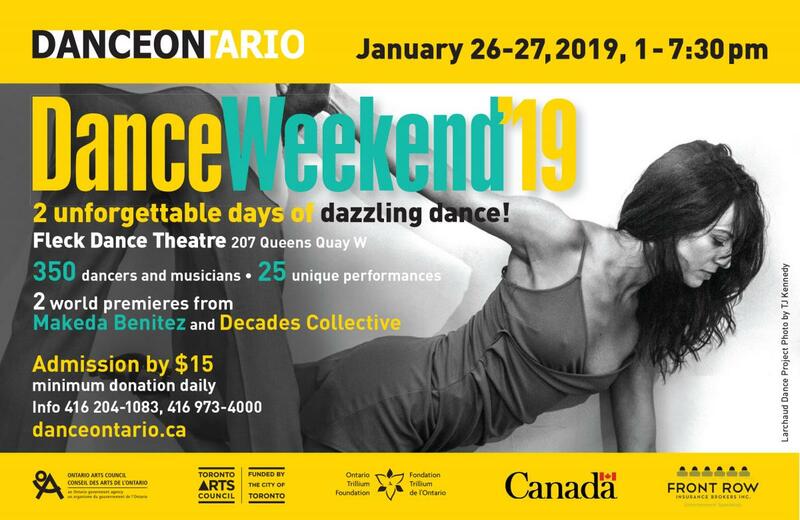 The Fleck Dance Theatre has a weekend of dance and the Power Plant throws a party to launch its winter season. 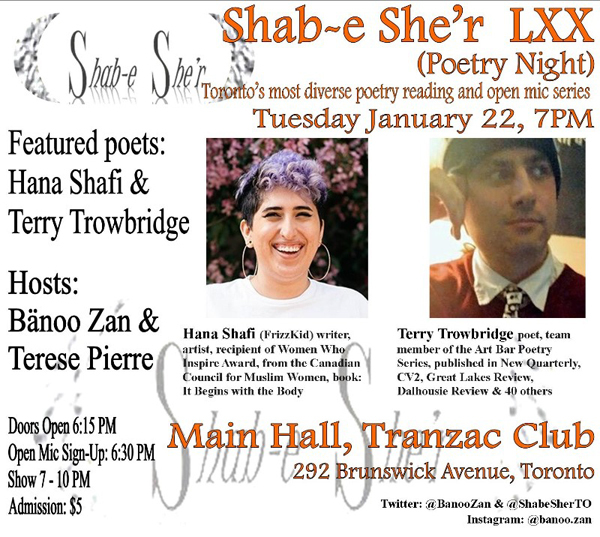 Shab-e She’r has its monthly Poetry Night and there’s a dinner with Muslims in nearby Milton. 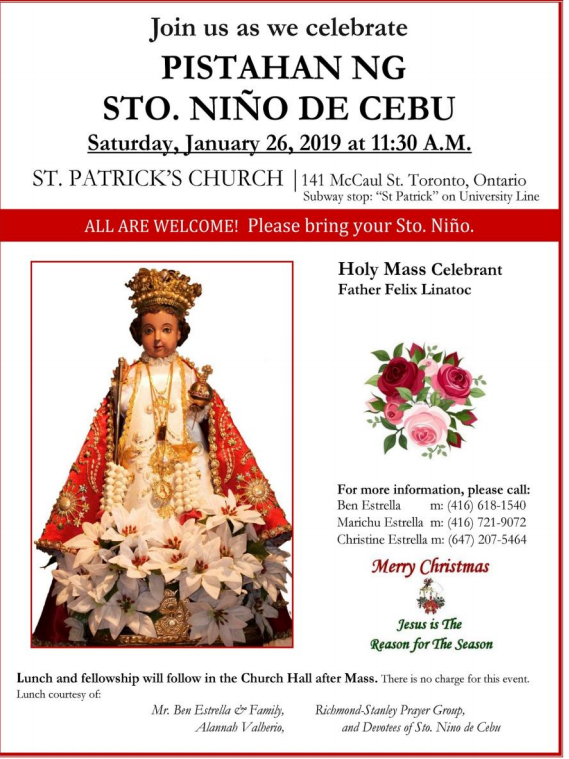 Filipinos will be parading with their statues of Santo Niño, the baby Jesus. And people of Scottish descent will be ice skating in kilts. The Ukrainians will have a concert. 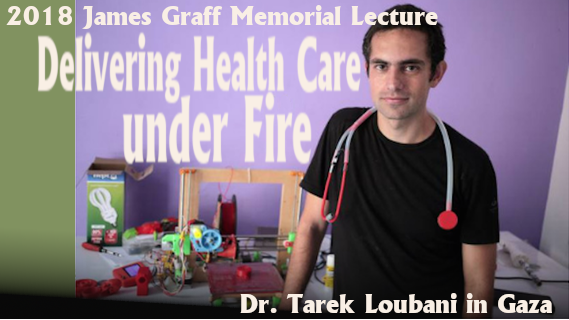 If you missed the Canadian doctor who was wounded recently in Gaza, you will have another chance to hear him speak. Most of the following events are free or almost free, and all are open to the general public. The world is indeed accessible in our city where it’s easy to meet your neighbours from other cultures, and to get to know them better. Africa. Maroons. Exhibition. 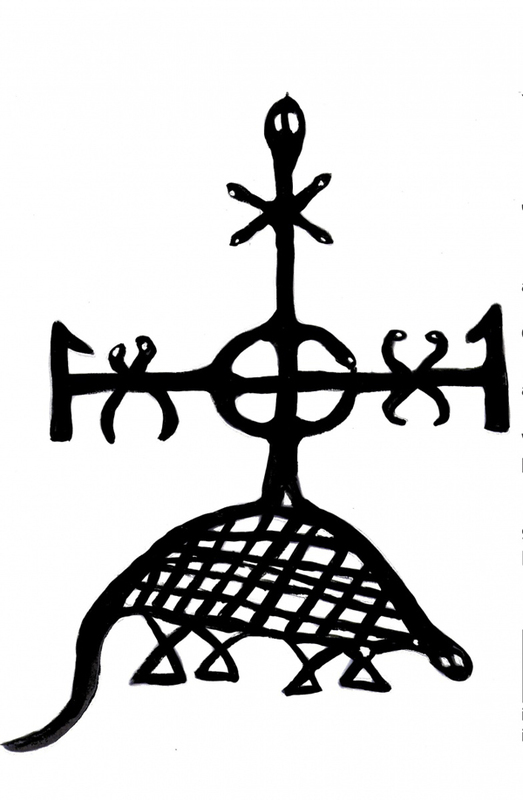 Winsom: I Rise; Art and the Afterlife. December 22, 2018 – July 20, 2019. Exhibition included with general museum admission. For hours, entry fee and free admission opportunities: https://ago.ca/. Gallery 201 and Gallery 238, Art Gallery of Ontario, 317 Dundas Street West. For information about I Rise: https://ago.ca/exhibitions/winsom-i-rise. Note from Wikipedia: Maroons were Africans and their descendants in the Americas who formed settlements away from New World chattel slavery. Arab. Muslim. U.S. Comedy from the Other Side of Fear. 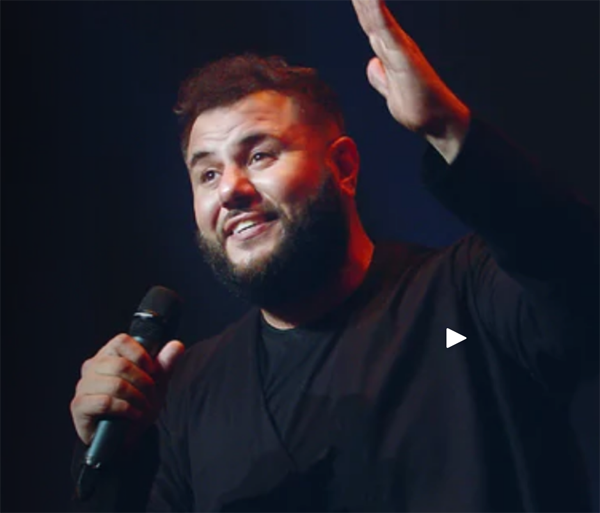 Mo Amer. January 25. 8:30pm. $30, $27 Friends, $22.50 students and seniors. Includes same-day Museum admission (redeem at Ticket Desk). Packages available. Aga Khan Museum, 77 Wynford Drive, North York. Image from Mo Amer website. Black History. Book Launch. Harriet Tubman Freedom Fighter. January 22. 7pm. Free to attend. A Different Book List, 779 Bathurst Street. 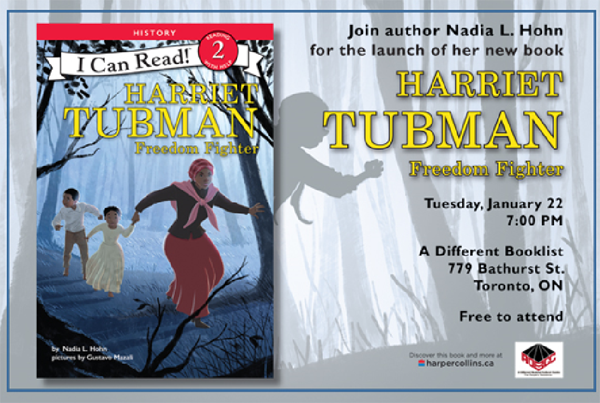 Join author Nadia L. Hohn for the launch of her new book. Ruth’s note: This is the first of this year’s many Chinese New Year celebrations that I’ve heard of. Outsiders usually feel welcome at such senior events. The actual Lunar New Year day is Tuesday, February 5. It’s the Year of the Pig. 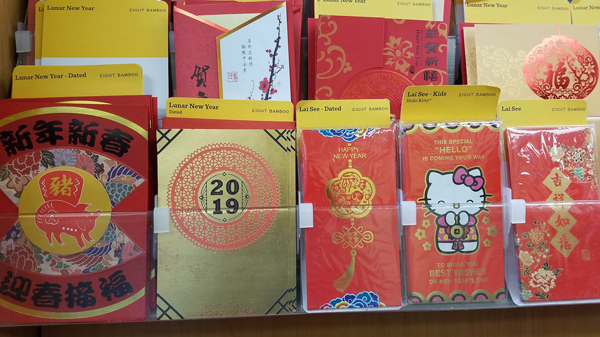 Image of Chinese New Year’s card rack at a Toronto postal store. Ruth Lor Malloy 2019. France. Algeria. Lecture-Reading by Jean-Paul Schintu on Albert Camus, His Youth in Algeria: 1930–1940. January 23. 7pm. Free. In French. Alliance française Toronto – Galerie Pierre Léon, 24 Spadina Road. Camus was a French philosopher, author, and journalist: https://www.alliance-francaise.ca/en/culture/lectures/albert-camus-his-youth-in-algeria-1930-1940. Jewish. 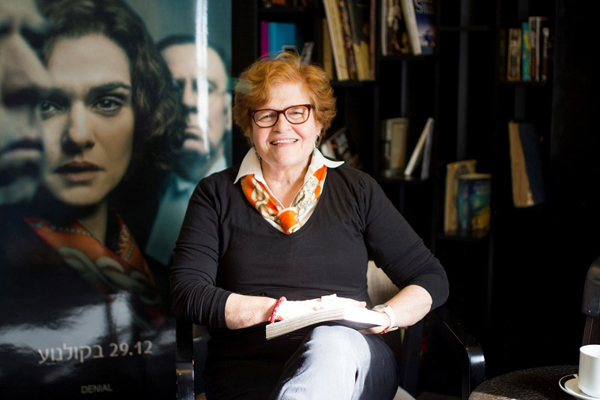 Here and Now: International Holocaust Remembrance Day, with Deborah Lipstadt. Thursday, January 31. 7:30-9:30pm. $20-$45. Bram and Bluma Appel Salon, Toronto Reference Library, 2/F, 789 Yonge Street. Join Professor Lipstadt for an illuminating discussion about the unsettling global resurgence of antisemitism and how it can be fought, as explored in her new book Antisemitism: Here and Now. Copies of the book will be available for purchase. A book signing follows the event. Jewish. Sepharic. The King Got Up One Monday Morning. January 26. 8-10pm. $20. CSI Annex, 720 Bathurst Street. 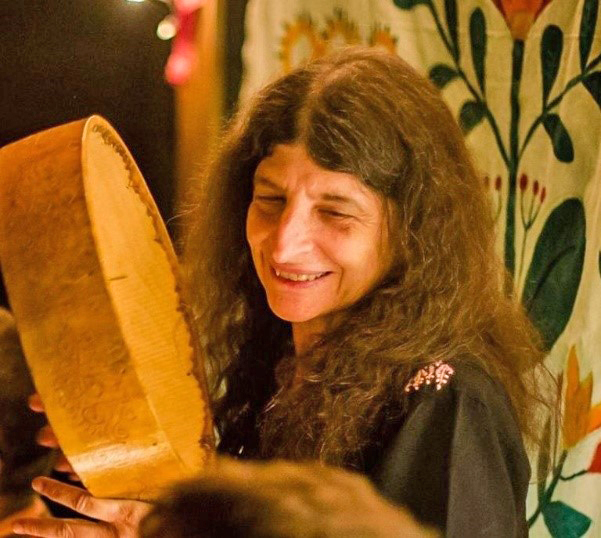 Ethnomusicologist, and multi-instrumentalist, Judith Cohen, performs sung stories and tales from Sephardic and pan-European traditions. “… A specialist in Sephardic songs, she has collected and studied these and many others, over years of travelling in Spain, Portugal, the Balkans, Morocco, Greece, Turkey, Israel and right here in Toronto and Montreal… She blends and mixes ballads, stories, languages, and anecdotes in unexpected ways, with a number of traditional instruments, and spontaneous communication drawing in the audience as if they were in her living room. Tickets purchased online at https://www.eventbrite.ca/e/the-king-got-up-one-monday-morning-tickets-49912878764?aff=eac2. 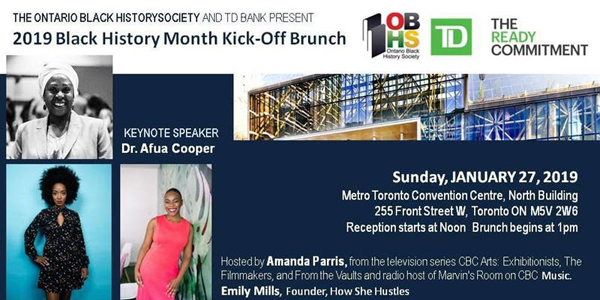 More information: e-mail: admin@storytellingtoronto.org; tel. 416-656-2445. Ruth note: the art of storytelling is still alive in Toronto. Jewish. Yiddish. Tantshaus! Yiddish Dance Workshop and Dance Party. January 27. 7-10pm. $10 at the door. Clinton’s Tavern, 693 Bloor Street West at Christie Station. Multicultural. Inuit. Senegal. U.S. Winter 2019 Opening Party. January 25. 8-11pm. Free. Cash bar available all evening. The Power Plant Contemporary Art Gallery, 231 Queens Quay West. 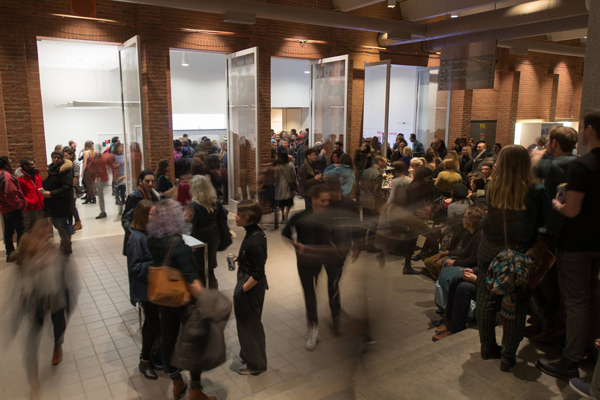 “… Be amongst the first to experience exhibitions by Shuvinai Ashoona, Omar Ba and Alicia Henry. For more information about the exhibition, visit: http://bit.ly/TPPExhibitions. Image from Power Point website. Muslim. Dinner and Conversations with Canadian Muslims. January 23. 6-9pm. Free. Paramount Fine Foods Milton, 1149 Maple Avenue, Milton. “Understanding Islam is best done by conversing with Muslims and not extremists. It never hurts to do this while enjoying a delicious meal together…………and this one is on us! 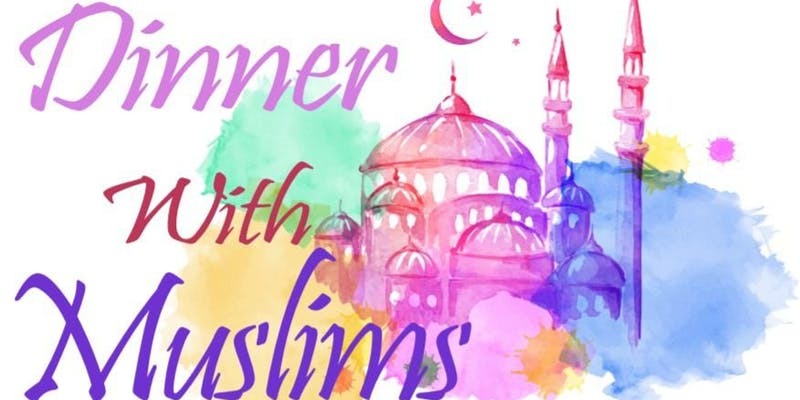 “Please join us for a free dinner as we continue our outreach programs engaging fellow Canadians and focusing on the many things that unite us. We have way more in common than differences. Philippines. The Celebration of Mass, Blessing of Statues and the Children. January 26. 11:30am-3pm. St. Patrick’s Parish, 141 McCaul Street. Lunch to follow in the Parish Hall and the Novena Prayer for the Infant Jesus. Dance procession with Statue will conclude the day.” For more information, contact Ben Estrella 416-618-1540. Scotland. Great Canadian Kilt Skate. January 27. 1:30-3:30pm. Free. Nathan Phillips Square, 100 Queen Street West. “We’re very excited about bringing the kilt–skate phenomenon for it’s 3rd year in a row, again to Toronto. 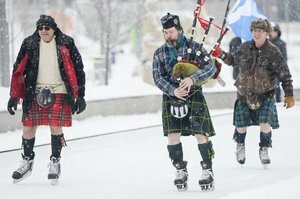 It is a uniquely Canadian and undeniably Scottish way to have fun during winter. This year in Toronto we have expanded the event to include Scottish Clan and Society information tents around Nathan Phillips Square. “Come join us to celebrate Scottish heritage in the heart of Toronto! Ukraine. 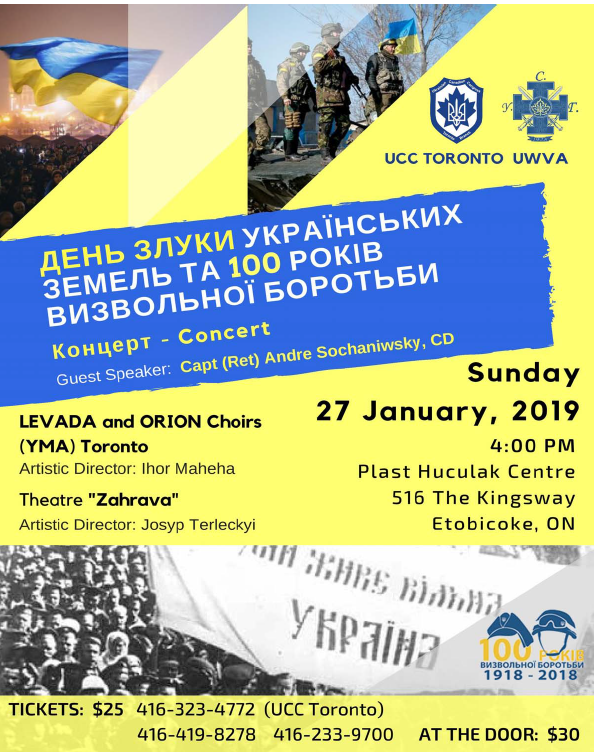 Ukrainian concert. January 27. 4pm. $25-$30. Plast Huculak Centre, 516 The Kingsway, Etobicoke. TorontoMulticulturalCalendar.com chooses to promote events that encourage a feeling of community in our culturally-diverse city. Mention doesn’t mean endorsement as we try to include events we think readers will find stimulating in the cultures of other groups. If you go to any of our mentioned events, please send us corrections or an account of your impressions so we will know whether or not to mention these events in future. All in one city! 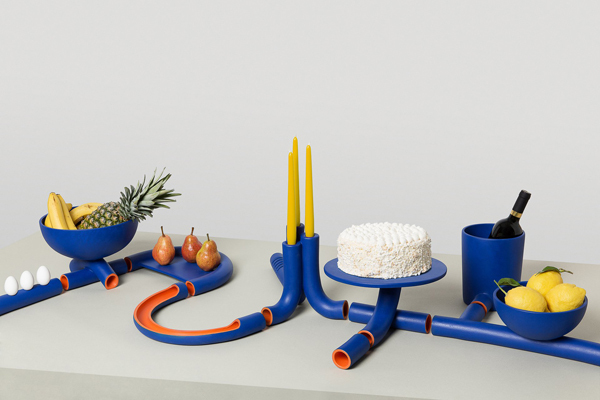 Unbelievable cultural treats and gifts in Toronto are revealed this week’s TMC. Thank you for this terrific digest. I’ve selected the inspiring teacher, Ms. Vern’s North Hill School children’s art work inspired by the AGO Kusama exhibit; stunning, adventurous works. Then Mo Amer, if I can get over to Scarborough. Next Prof Lipstadt (from Emory U) lecture, and the terrific design show at Italian Cultural Center of the works of Didero and Molteri. Really worth the trips even in freezing weather.